The Green Gathering 2016 was SLiCK’s first roadshow. 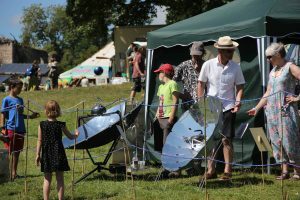 Solar cooking in the UK is carried out in variable weather but we got perfect conditions for the 4 day event. 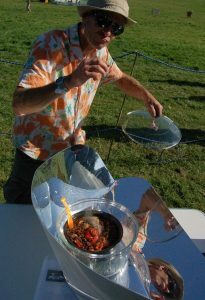 Our goal was to demonstrate practical solar cooking to visitors with as much theory as you can eat. This festival occupies a niche in the UK outdoor festival scene – it’s completely off-grid, running on wind, solar and people. This limits the scale but it remains a large and popular event with environmentally minded visitors from all over. It was a highly receptive crowd and most had never encountered a solar cooker before or were unfamiliar with the concept. Our location benefited from a southern aspect, with all day sunshine possible. We experienced a lot of interest and learnt a lot. What Solar Cookers did you have on Show? We had a selection of all current types, along with some prototypes. While SLiCK markets two of the units below, our aim is to demonstrate all the types we can and always with an open and even handed approach. All day solar cooking with multiple cooker types is a developing art. I’ll be expanding more on this in later posts, as the job of ‘solar chef’ has little precedent at this time. I guess its like managing a busy kitchen with ‘stacked’ cookstoves, closely watching food volumes, cooking times, solar energy inputs and meteorological conditions. All while talking to visitors and keeping an eye on hazards – its hot stuff!. To be sure SLiCK’s crew ate solar every day – our evening meal together was a combination of foods cooked during the day, kept piping hot in fireless cookers as necessary. All food (including hand out snacks) was vegetarian, delicious (if you ask me!) and with no accidents or burns. Multiple Cookits and jar-in-jar containers were used for Dave Oxford’s workshop, ‘how to cook an egg in pure sunlight’. 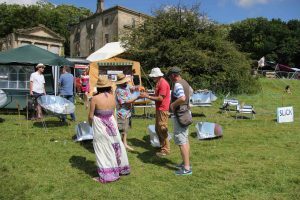 Attendees learnt about the physics of solar cooking whilst seeing it in action. We learnt a lot from this and will be developing the syllabus further. 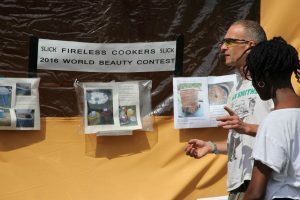 The worlds first ‘Fireless Cooker Beauty Contest’ was held on our site. Well, more about this later, but a great selection of beauties was presented to our visitors, who voted for the prettiest over the festival period. Kenya’s Faustine Odaba won this contest with her great selection, hand made by women there as a way of supplementing their income. We raised £100 in donations and 3 efficient and award winning Ecozoom Jet rocket cookstoves will shortly be presented to Faustine’s Nairobi charity in Nairobi . – our favourite worthy cause. We figured out some of the peculiar aspects of a large solar cooking demo. These included what we needed to be doing to keep things safe and clean while operating heat emitting devices. Any kind of scary incident with our demo might have got us closed down on the spot. We took a lot of care. Much of what we pioneered here can be replicated, at other events and maybe at the `Green Gathering 2017′ if we get invited back. What was the response from Visitors? All in all the reaction was very positive. People were keen to learn – many were aware of solar cooking and some had even seen or made a solar cooker – with variable results reported from these experiments – mostly poor. Very few had encountered a manufactured solar cooker. In this context our display was eye opening. Some of our cooker types had never been demonstrated in the UK before. People understood the global issues that solar cookers can help with – indoor air pollution, reducing deforestation and using free solar energy instead of charcoal, wood or fossil fuel. When asked about the number of people cooking on firewood most people far under-estimated the World Health Organisations 3 billion figure. Visitors mostly ‘got’ the concept of integrated cooking which combines improved biomass cookstoves, fireless cookers and solar cookers – allowing 24 hour cooking using no fossil fuel and minimal wood fuel. The question ‘I want to eat when the sun isn’t shining’ didn’t arise. Far too many negative views were expressed about solar cooking in the UK. My favourite was ‘Its OK for Africa, but it wouldn’t work here…… ‘ as i pulled out a sizzling tray of frying onions / popping mustard seeds….., defensively they followed with ‘well it wouldn’t work in Blackburn!’. Perhaps they’re right?, I don’t know for sure (yet!). It was great to get the opportunity to challenge these assumptions directly, its what we at SLiCK have set out to do. This was an outreach event and it was met with a lot of enthusiasm. 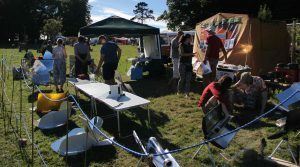 Our event at the Green Gathering ’16 was probably the biggest solar cooking demo in europe this summer. We’re still figuring it out. SLiCK is self-resourced and this sets the scale of what’s possible. We would certainly like to bring some more cookers types on site and develop both the cooking aspect and the learning part. 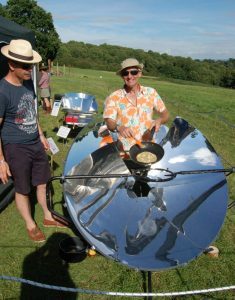 There are sure to be plenty of ideas leading from this event for a fantastic SLiCK Solar Cooking roadshow in 2017. Maybe we we’ll see you at one of them? This entry was posted in Ecozoom UK on September 20, 2016 by ecozoomuk.